T.E.N. Opens Nominations for the 2018 Information Security Executive® Northeast Awards | Company Newsroom of T.E.N. ATLANTA, April 24, 2018	(Newswire.com) - T.E.N., an information technology and security executive networking and relationship-marketing firm, announced today that nominations will be accepted until July 30, 2018 for the 2018 Information Security Executive® (ISE®) Northeast Awards. 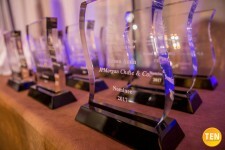 Awards include the Information Security Executive® of the Year, which recognizes executives who have made a positive impact on their organizations through risk management, data-asset protection, regulatory compliance, privacy and information security; and the ISE® Project of the Year, which recognizes a project completed during the previous 12-18 months that has had a significant impact on an organization’s risk management or information security posture. Eligible nominees meet all appropriate criteria and are based in the U.S. Northeast region, which includes Connecticut, Delaware, Maine, Massachusetts, New Hampshire, New Jersey, New York, Pennsylvania, Rhode Island, Vermont and Washington DC. Nominees, finalists and winners will be recognized at the ISE® Northeast Executive Forum and Awards on Oct. 3, 2018 at the Westin Times Square in New York City, New York. The Executive Forum will include keynote speakers, interactive roundtables moderated by the CISOs and VPs of participating companies and engaging panel discussions. Finalists and winners in both categories are announced at the awards gala that evening and recognized through press coverage and inclusion on the T.E.N. and ISE® websites. Organizations taking part in previous programs have included leading organizations, such as ADP, Allergan, Comcast, Horizon Blue Cross Blue Shield, The Interpublic Group, JP Morgan Chase, and MUFG Union Bank.